Is that not a humongous flag? 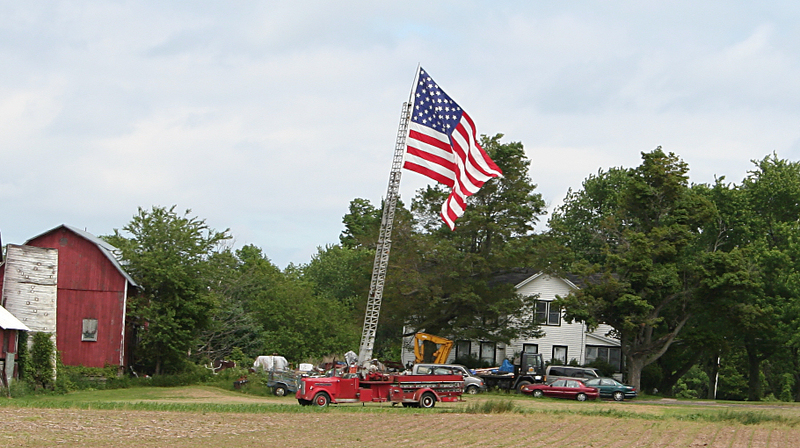 I live in a rural area and we’re a patriotic bunch out here. One of my neighbors hoists this flag up every year for the holidays. I thought some of you would enjoy seeing the USA flag flying proudly too. They are a mixture of machine embroidery and hand embroidery, and all I can say is WOW. 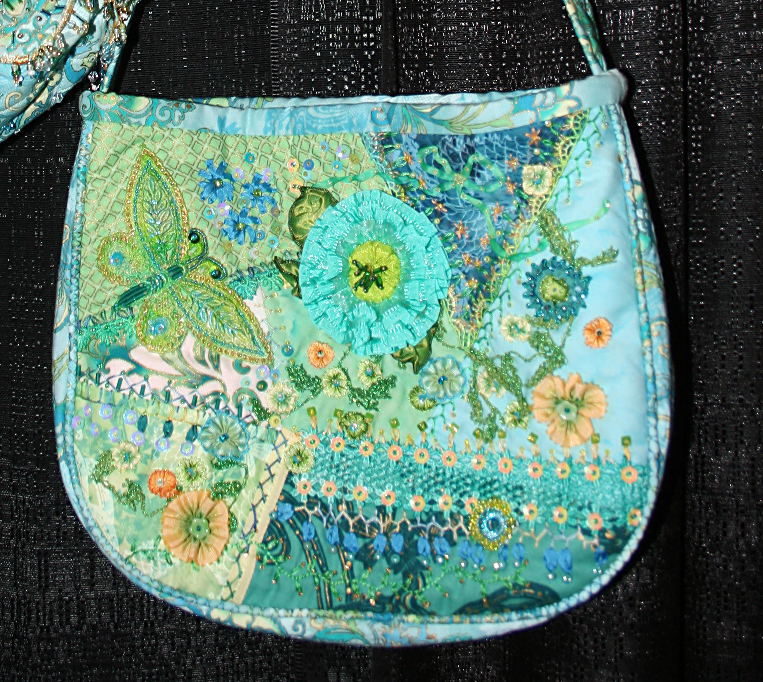 Now I want to make a purse, but to hang on the wall as a piece of art. 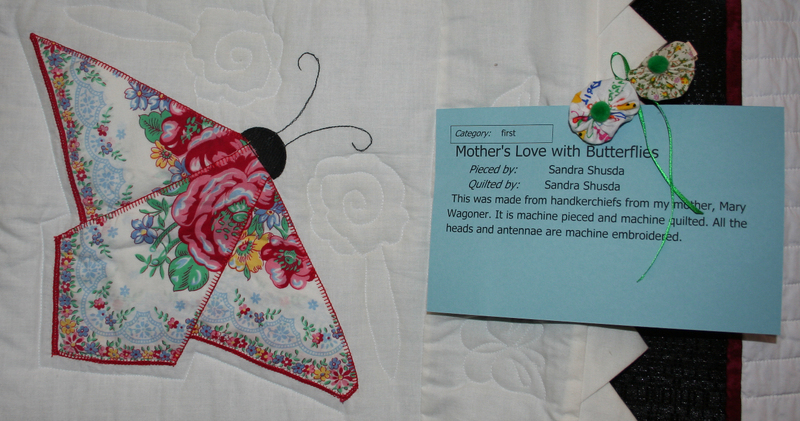 Quilt shows are great sources of inspiration. The comraderie of talking with fellow fiber enthusiasts, different styles and techniques exhibited, plus the abundant use of so many color combinations displayed, contribute to promoting more creativity. Don’t you love how that works? 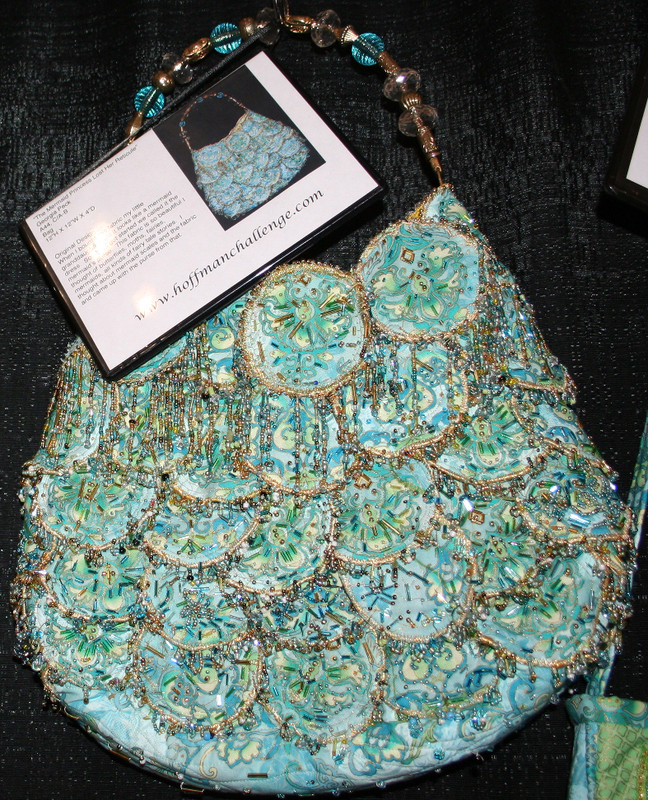 I have more pictures from the show to share, and I went to 2 more shows yesterday. June has been a very good month for fiber shows in my area of the country. There will be lots more pictures coming. I hope you are enjoying them. 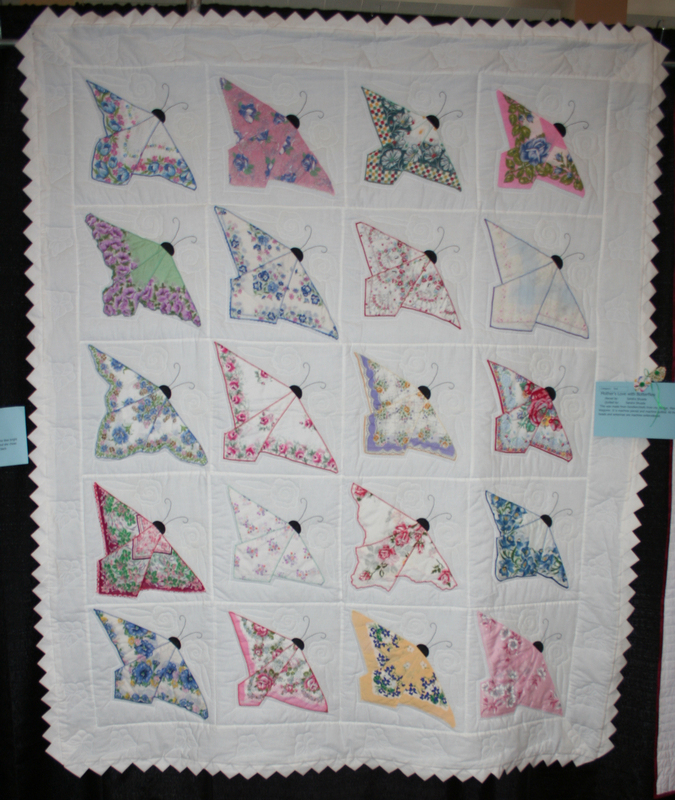 The first weekend in June was my local quilt club’s 75th anniversary and it was celebrated with a most excellent quilt show. 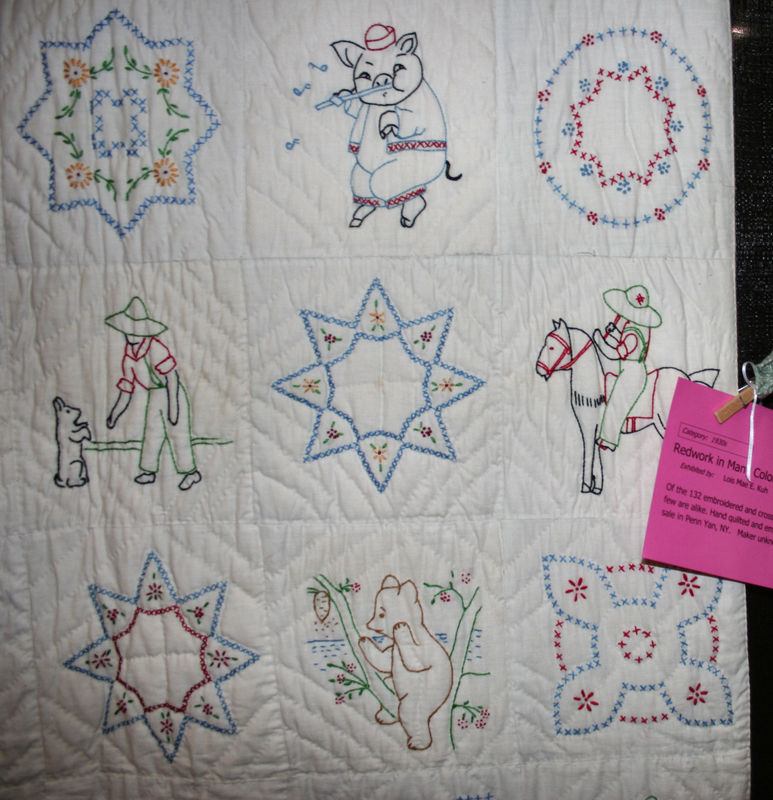 There were over 1,000 quilts in the show, and it took a full day to see everything. Luckily, it was open for 3 days, so everyone in the community had plenty of opportunity to enjoy the display. 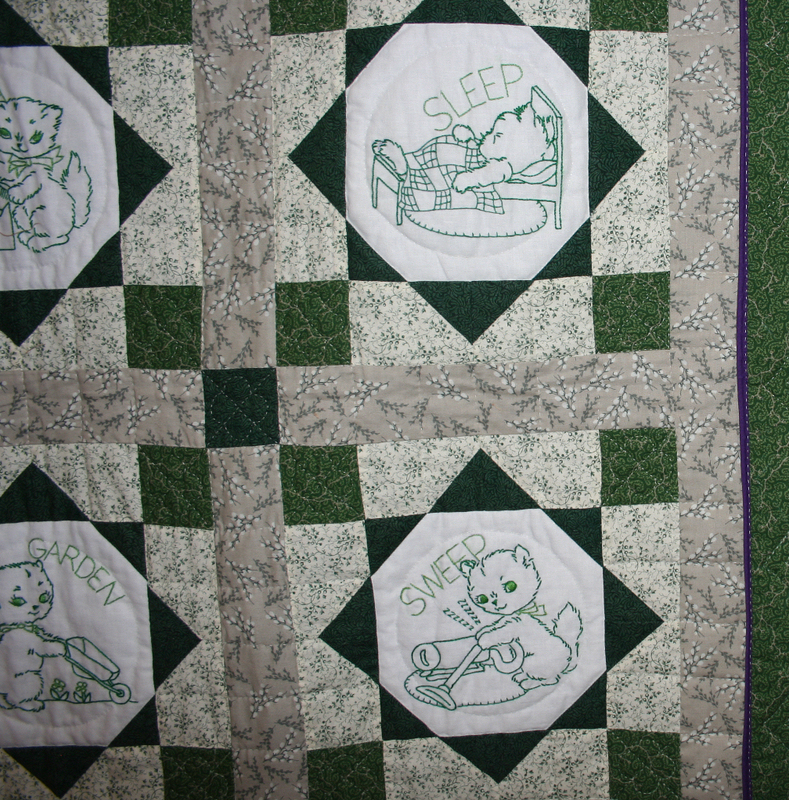 I had 3 quilts in the show and have already posted pictures on the blog, so will post a few that caught my eye for various reasons, because believe me you, each and every quilt was wonderful. 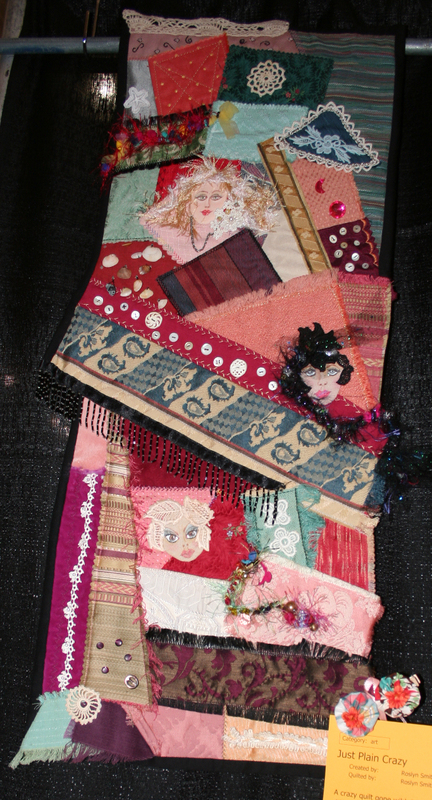 Doesn’t that evoke the same feeling as the 30’s quilts? Now I wasn’t born in the 30’s, but I remember doing a lot of the embroidery from that era. My grandmother would show me how to do the stitches, and I would copy her hand movements. I didn’t have a care in the world. 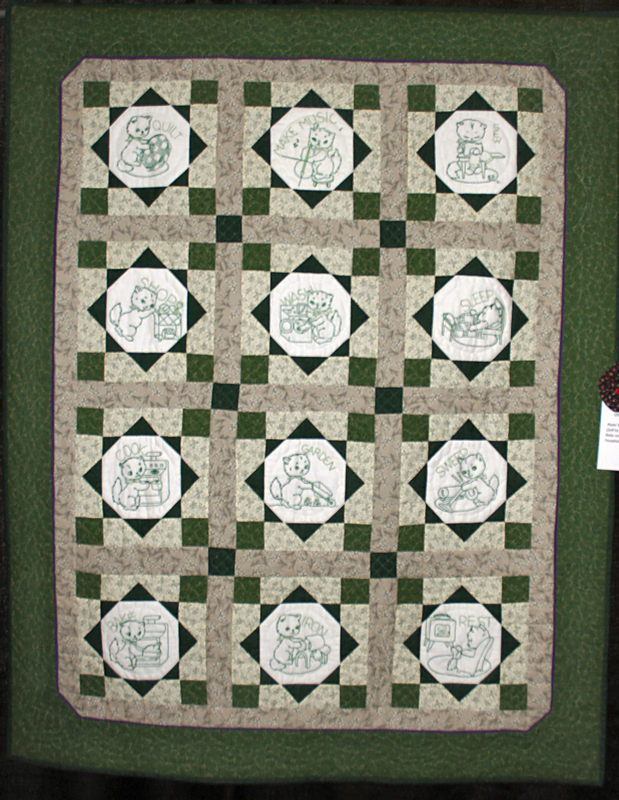 My first embroidery project was making embroidered tablecloths for our card table. Remember those? It seems like everybody had card tables (For those who don’t know what they are, they are portable tables with folding legs that had seating for 4.) and set them up for parties, playing cards, or letting the kids have a place to do crafts. You could buy the tablecloths at the 5 and 10 stores – which are a thing of the past – and there were a lot of patterns to choose from. 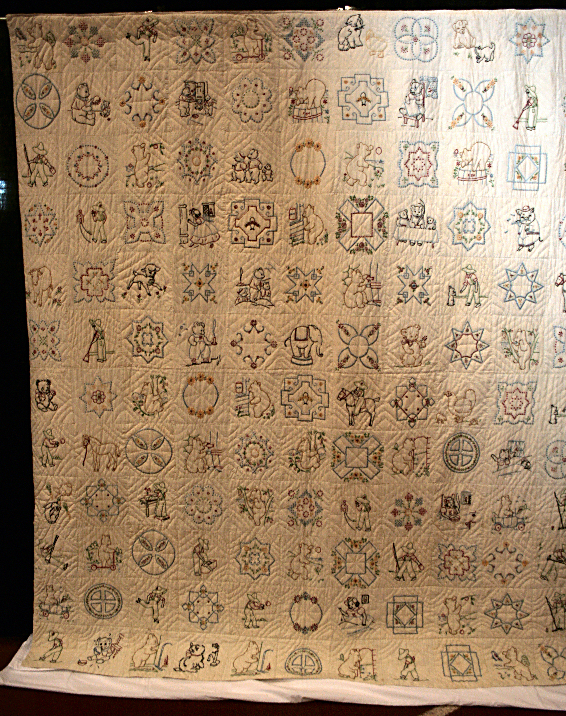 Some were outline embroidery, some were cross stitch, but they all had the patterns stamped on them with a blue ink which was covered by your embroidery threads. My grandmother’s old Victorian house has since been torn down and is now the site of a stadium, but I’ll never forget learning how to sew, knit and embroider in my grandmother’s house. I was in a surrounding filled with high tin ceilings, glass doorknobs, a hand cranked coffee grinder on the kitchen wall, inviting smells coming from the stove, and best of all, got to spend one-on-one time with a grandmother who spoke broken English, but managed to convey her love for me, and passed on her love of handwork to another generation. May is the trifecta of celebrations for me. It starts out with Mother’s Day, then my husband and I got married May 12, and lastly it’s my birthday at the end of the month. With all the parties, I was remiss in posting to the blog, but have plenty of posts lined up over the next few days. Mother’s Day was celebrated with my daughter and SIL. They have a beautiful boat, and we were invited to the docks where we feasted on grilled goodies my SIL made for us. It was too cold to go out on the lake, but we were nice and cosy in a shelered spot. The sun was out, and I learned how to make pizza on Naan bread. I liked it so much, I’ve made it at least 5 times since then. Thank-you dear hearts for a wonderful day. I didn’t feel well for our wedding anniversary, so my husband got take-out for us instead. Now this was take-out from a really good restaurant – Agatinas. It was more expensive than what you would generally think of as take out food, but we wanted to suitably celebrate our 38th wedding anniversary, and we did. The May Ogden Art Group meeting was a going away party for a dear friend. Pat is moving to Rhode Island and while we will really miss her, she and her husband will be able to enjoy watching their grandson grow up. Family is what it’s all about, and I’m very happy she will be able to see her daughter, SIL, and grandson all the time now. There wasn’t a lot for Show and Tell at this meeting, as we focused on food. LOL What’s a going away party without lots of food? I should have taken a picture of the buffet table, because it was loaded with goodies. I did eventually come out of my food coma enough to take a few photos though. 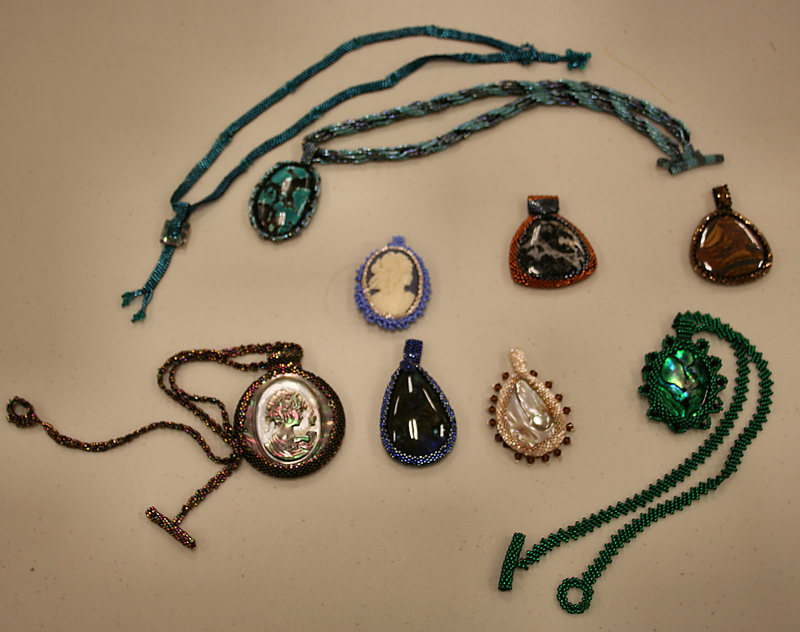 Lucy kindly showed us how to sew them to ultrasuede and use them for pendants. Isn’t her work beautiful? She was tweaking the final fitting and her client will be thrilled when she receives it. The fabric is stunning and Janet has done a lot of quilting on this jacket. 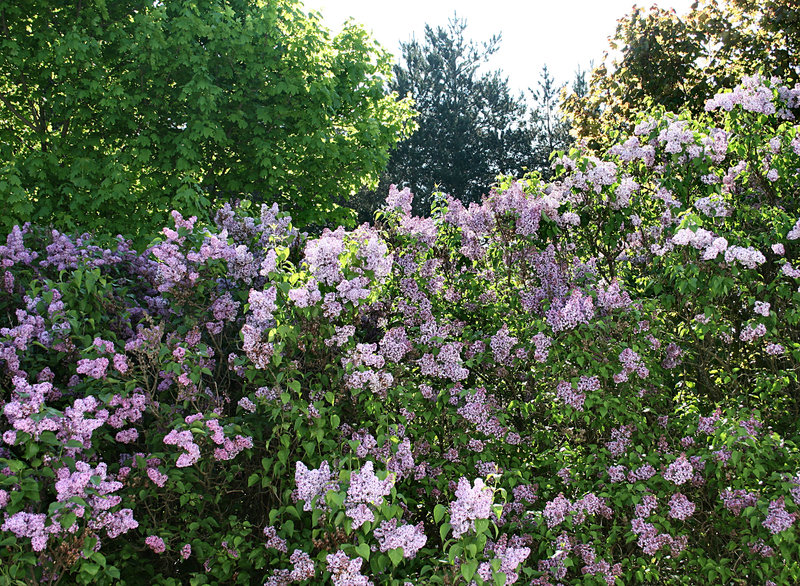 It is such a pleasure to see the sun rising over the trees and the gorgeous lilac bushes. The air is heavily scented in May from the 50 lilac bushes my husband planted, and the colors range from white, pink, light lavendar, to medium and dark purple. Even the UPS and the Fed-Ex delivery drivers comment on those lilacs. They are quite spectacular. I thought you might enjoy seeing them too.